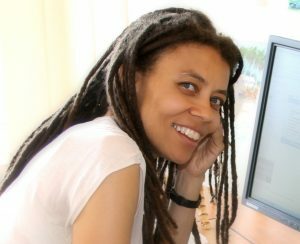 Kia Corthron was the 2017 resident playwright of Chicago’s Eclipse Theatre Company, which produced three of her plays including the world premiere of Megastasis. Her debut novel The Castle Cross the Magnet Carter was the winner of the 2016 Center for Fiction First Novel Prize. For her body of work for the stage, she has been honored with the Simon Great Plains Playwright Award, the Windham Campbell Prize for Drama, the USArtists Jane Addams Fellowship, the Otto Award, the Lee Reynolds Award, the McKnight National Residency, and other awards. Her many plays, including Breath, Boom, Force Continuum and A Cool Dip in the Barren Saharan Crick, have been produced in New York by BAM, Playwrights Horizons, Ensemble Studio Theatre, NY Theatre Workshop, Atlantic Theater Company, Manhattan Theatre Club; in London by the Royal Court and Donmar Warehouse; and in the U.S. regionally by Minneapolis’ Children’s Theatre, Mark Taper Forum, Alabama Shakespeare Festival, Yale Rep, Huntington, NY Stage & Film, Baltimore’s Center Stage, Goodman, Hartford Stage and elsewhere. Writers Guild and Edgar awards for The Wire. Dramatists Guild Council, Authors Guild, New Dramatists alumnus.